India has so much to offer. Explore Mumbai, the rock-cut cave temples on Elephanta Island, the unparalleled Taj Mahal, the romantic palaces and forts of Rajasthan, ride an elephant in Jaipur and the Hindu temple at Khajuraho. Explore New Delhi’s Qutub Minar, Humayun’s Tomb, the India Gate and Rashtrapati Bhawan. In Old Delhi, visit Raj Ghat, Delhi’s monument to Mahatma Gandhi, the Red Fort citadel and the great mosque of Old Delhi, Jama Masjid. Admire the amazing astronomical devices at the outdoor Jantar Mantar Observatory and visit Jaipur’s most famous building, the pink sandstone Hawa Mahal or “Palace of the Winds.” Explore the Amber Fort, followed by an elephant ride at a local village accompanied by a professional mahout. Visit the imposing Agra Fort, a UNESCO World Heritage Site built of red sandstone and marble. After a sunrise stop at the Taj Mahal. Timeless cities, thousands of years of compelling history, breathtaking architecture, like the Taj Mahal and the temples of Khajuraho. 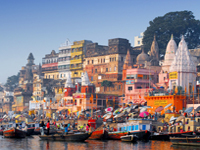 Dramatic, landscapes… a rich mix of local cultures and cuisines; and age-old spiritual traditions on the ghats along the River Ganges. 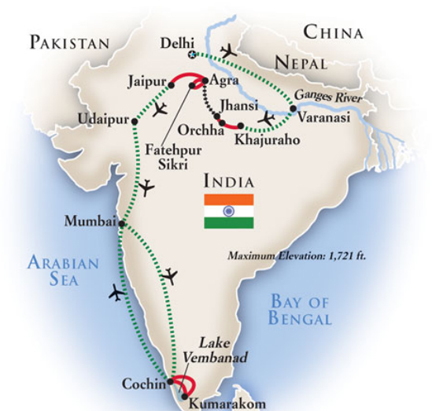 From bustling Delhi to mystical Varanasi and the “Pink City” of Jaipur, to Udaipur, the “City of Lakes,” northern India invites you to discover these treasures on an unforgettable journey. 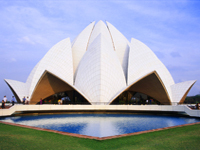 Your India tour begins at The Oberoi, New Delhi; renowned for gracious service; it’s set right in the heart of the city. Explore India’s capital city with an insider guide; a sightseeing excursion shows you the Secretariat buildings, Parliament House, Presidential Palace, and India Gate, commemorating Indian and British soldiers. Stop at the Gandhi Smriti Museum, paying tribute to the inspiring leader Mahatma Gandhi who forced change through non-violent protest. Visit two UNESCO World Heritage Sites – the five-story sandstone Qutb Minar Victory Tower, and Humayun’s Tomb, set in beautiful gardens. This Mughal creation popularized Persian-influenced architecture and was an inspiration for the Taj Mahal. Day 3 – Historic Delhi Take a trishaw ride past colorful bazaars, sacred temples, and colonial monuments through the winding streets of Old Delhi, the capital of Muslim India from the 12th through the 19th centuries. 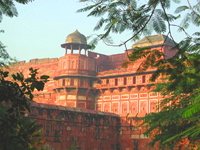 See the sumptuous Red Fort palaces, the symbol of Indian nationhood. 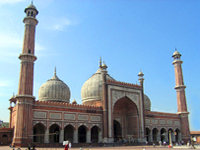 Visit India’s largest mosque, the white marble Jama Masjid, and see Rajghat, Mahatma Gandhi’s cremation site. 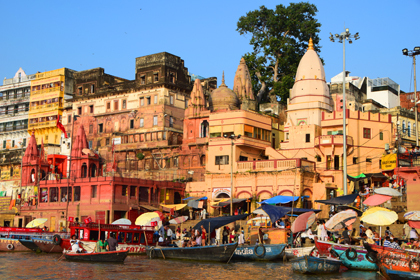 Fly to the ancient city of Varanasi, built on the banks of the sacred River Ganges. Since the 6th century BC, this city has been a key destination for pilgrims who seek blessing and purification in the river’s holy waters. A sightseeing tour visits Sarnath, where Buddha gave his first sermon, and the National Museum, home to a priceless sculpture collection dating back to the 3rd century BC. Tonight, travel by trishaw through the city for a journey by boat along the River Ganges to witness ceremonies “putting the river to sleep.” Amidst hundreds of lighted candles and flower offerings, tonight will be a special highlight of your India tour. Rise early for a cruise on the River Ganges to view the Varanasi sunrise ceremonies. A lecture precedes departure for the airport for the flight to Khajuraho for an overnight stay. The Khajuraho Group of Monuments were designated a UNESCO World Heritage Site in 1986; during the Chandella dynasty about a millennium ago, between 950 and 1,050 temples were built. They were described as striking a perfect balance between architecture and sculpture; though only about 20 remain today, their exquisitely detailed sculptures make them one of India’s most revered works of art. Your tour continues to historic Orchha, where ancient palaces, temples and cenotaphs speak volumes about India’s Mughal empire. Once inhabited by royalty, today the eerily silent ruins are home to brilliant green parakeets and chattering langurs. See the soaring spires of the cenotaphs before you travel by train to Agra, home of the magnificent Taj Mahal. Your room in the luxurious Oberoi Amarvilas offer a wonderful view of this stunning man-made wonder…what a sight to wake up to! Guests may wish to visit the Taj Mahal in time for sunrise. 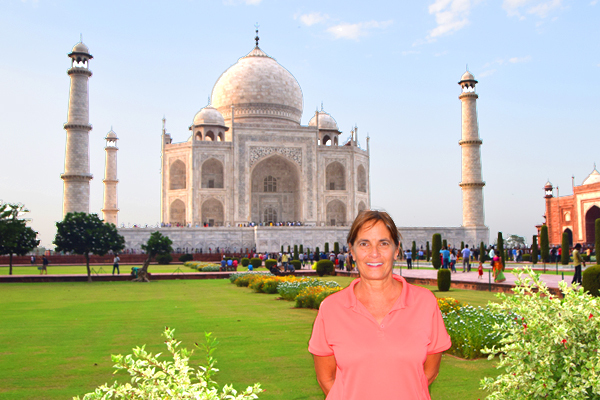 Those not going quite so early will join your Director a little later than sunrise for a guided visit to the spectacular Taj Mahal, with time to explore on your own and take photographs. 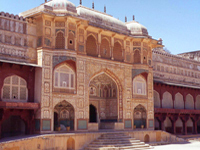 A guided tour of the massive red sandstone Agra Fort, a UNESCO World Heritage Site, follows. Inside, you’ll get a very good look at medieval lifestyles of 16th- and 17th-century Mughal emperors. An afternoon excursion to the walled imperial city of Fatehpur Sikri for in-depth exploration of this remarkably preserved site, another UNESCO World Heritage Site. Travel to Jaipur for a two-night stay at The Oberoi Rajvilas, reflecting the gracious lifestyles of India’s legendary Rajput princes. A sightseeing tour of Jaipur includes the City Palace Museum and the Jantar Mantar Observatory – a collection of architectural astronomical instruments for measuring time, predicting eclipses, tracking stars in their orbits, figuring out the declination’s of planets and determining the celestial altitudes. 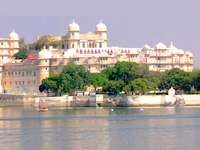 And the most interesting fact – they were all built by Maharajah Jai Singh II between 1727 and 1734! Attend a special evening fit for Maharajah royalty tonight, celebrating India’s cultural traditions and cuisine. A highlight of your India tour, today’s sightseeing includes the many gems of Jaipur, from the massive gateways and pillared pavilions of Amber Fort to a tour of Amber Palace, with its magnificent domes, massive ramparts and glittering hall of mirrors. Enjoy an afternoon at leisure, pursuing what interests you most in Jaipur. Fly to Udaipur to continue your India tour with a tranquil cruise on Lake Pichola, taking in views of island palaces, ancient temples along the shore, and the old walled city. Enjoy a two-night stay amidst the romance and splendor of your palatial lakefront resort, rated the “number one hotel in the world” by the readers of Travel + Leisure. Visit the 18th-century fountain gardens of Saheliyon Ki Bari, and the Jagdish Mandir Temple. View the City Palace, a labyrinth of richly decorated courtyards, frescoed galleries, and marble temples. Learn the art of dressing in a sari and turban this afternoon. See the complex of temples at Nagda and Eklingji before flying back to Delhi. Arrive late day, where rooms have been reserved at a hotel close to the airport. Tour ends in Delhi. Inquire about optional 18 day tour.